Dining at Poseidon is more than simply a great meal, it is an experience of the true flavors from a region that produced some of the earliest culinary delights known to man. From the whole fish imported from the Aegean Sea, to the Kalamata olives flown in from the Pyliotis family's own olive groves in Kalamata, nearly all ingredients are imported from Greece. 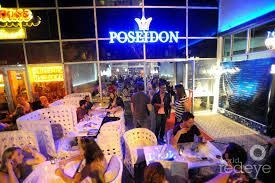 Poseidon is real a window to Greece in South Beach, an authentic culinary journey to Greece. Chef Demetrios Pyliotis is the first to import actual pure masticha (gum) from Skinos trees of the island of Chios-Greece and use it in cooking. Masticha lobster bisque soup. Also the only chef who prepares the whole fish on the grill without any cuts and cook to perfection. In addition, Demetrios has the technique to make the most tender grilled Mediteranean octopus. It's called M&M because it melts in your mouth and not in your hands! Dining at Poseidon is more than simply a great meal, it is an experience of the true flavors from a region that produced some of the earliest culinary delights known to man.